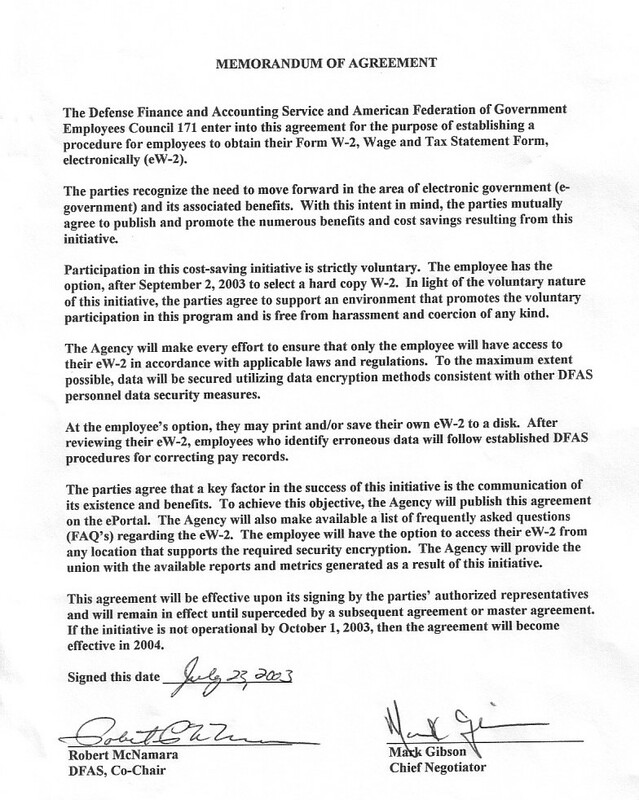 The Defense Finance and Accounting Service and American Federation of Government Employees Council 171 enter into this agreement for the purpose of establishing a procedure for employees to obtain their Form W-2, Wage and Tax Statement Form, electronically (eW-2). The parties recognize the need to move forward in the area of electronic government (e-government) and its associated benefits. With this intent in mind, the parties mutually agree to publish and promote the numerous benefits and cost savings resulting from this initiative. Participation in this cost-saving initiative is strictly voluntary. The employee has the option, after September 2, 2003 to select a hard copy W-2. In light of the voluntary nature of this initiative, the parties agree to support an environment that promotes the voluntary participation in this program and is free from harassment and coercion of any kind. The Agency will make every effort to ensure that only the employee will have access to their eW-2 in accordance with applicable laws and regulations. To the maximum extent possible, data will be secured utilizing data encryption methods consistent with other DFAS personnel data security measures. At the employee�s option, they may print and/or save their own eW-2 to a disk. After reviewing their eW-2, employees who identify erroneous data will follow established DFAS procedures for correcting pay records. The parties agree that a key factor in the success of this initiative is the communication of its existence and benefits. To achieve this objective, the Agency will publish this agreement on the ePortal. The Agency will also make available a list of frequently asked questions (FAQ�s) regarding the eW-2. The employee will have the option to access their eW-2 from any location that supports the required security encryption. The Agency will provide the union with the available reports and metrics generated as a result of this initiative. This agreement will be effective upon its signing by the parties� authorized representatives and will remain in effect until superceded by a subsequent agreement or master agreement. If the initiative is not operational by October 1, 2003, then the agreement will become effective in 2004.